Diamond Acorn, front - 4 3/8" x 1 7/8" x 5/8"
Diamond Acorn, back - 4 3/8" x 1 7/8" x 5/8"
The Acorn Mold carries the initials EB FL and the number 16. It is estimated to be a minimum of 200 years old and as the photos show it is a great little piece. The detail is very nice with the caps of the acorns plainly showing their design. Notice the reverse side of this mold. It looks to be unfinished which makes it still a work in progress. 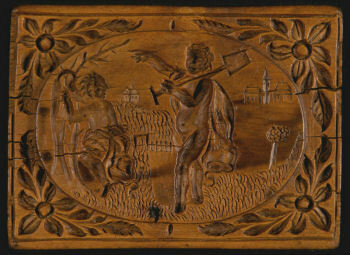 Could it have been that the carver was called away to defend his family and never returned to finish this piece? 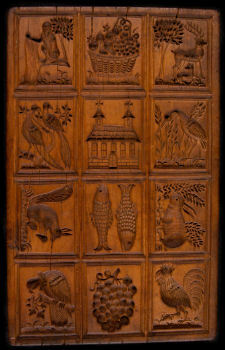 Perhaps the carver had carved so many molds that he just put it down and called it quits. 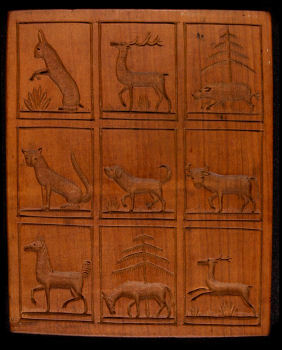 Maybe it was a learning exercise for the carvers son to finish the one side to begin the trade of the Father? Still a very beautiful and intriguing mold that has its own story to tell. Frankonia mold - 9 5/8" x 5 5/8" x 5/8"
The board "Frankonia" has 17 images. The wood is fruit or nut and is smooth to the touch from decades of use. This mold is German and came from a bakery in the town of Weißenburg, Frankonia in Bavaria and dates to between 1800 and 1850. This board is a beauty with character and warmth and plenty of detail. 8 1/16" x 5 1/16" x 11/16"
This mold measures has 12 pictures. From decades of loving use it is well worn. The wood has a few splits but that detracts nothing from this beautiful piece of usable art. 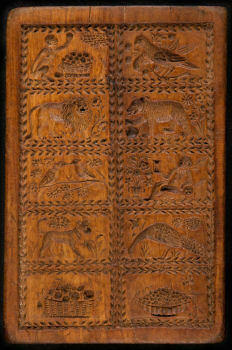 It is made from nut or fruit wood and the detail work is first rate. Notice the fur on the rabbit, the feathers on the birds and the scales on the fish. 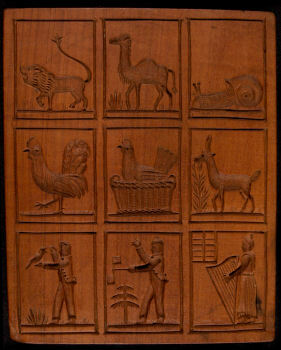 The motifs are all great and are mostly of animals. There is also a church, a basket of fruit and a bunch of grapes. The carver of this mold had an eye for details. Bird 6" x 4 7/8" x 3/4"
This mold is finely detailed with fur, feathers, seeds, hair and grasses. Mold from the 18 th. century, front - 4" x 2 7/8" x 3/4"
Mold from the 18 th. century, back - 4" x 2 7/8" x 3/4"
Probably was in the possession of a Swabian Baker's shop/confectionery. It carries a signature that I can not quite make out. The motif is not quite understood. The two people could be gardeners. Someone	suggested that the image kneeling looks like an Indian? I'm of the belief that they are early horticulturists. The oval image is raised slightly from the border. 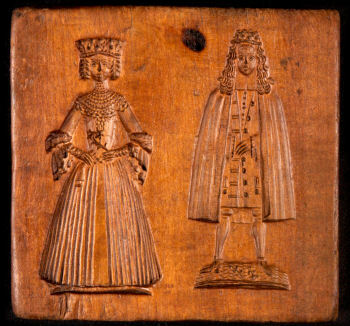 This is a fine representation of a Springerle mold that has lasted a few centuries. It is showing it's age with splits in the wood but these do not detract from the beauty of this mold. Angelika mold, front - 4 5/8" x 4 5/8" x 1"
Angelika mold, back - 4 5/8" x 4 5/8" x 1"
Made from fruit wood. Very detailed and nicely carved. It has a signature on it as well. 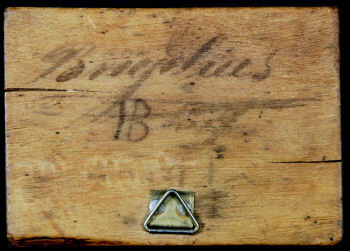 I do not know if it would be the owners signature or the carvers. From the resource materials I have, this mold looks to be from the 18th century. To see a larger picture of details in a new window click on the image, when new window has opened click on image again if it is not larger. Close new window to return to original site. 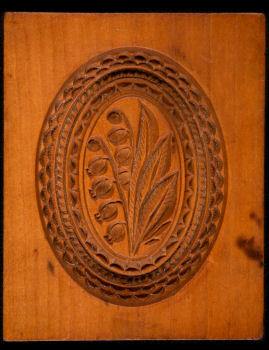 This mold measures 12 1/4" x 5 1/8" x 1 1/4" and may be attributed to Hartmann Kistener who carved molds around the 16/17 century. The H K with a cross is a mark that is identified as his in the book "Die alte Kunst der süßen Sachen". It is on the last page. It is only slightly different than the mark in the book. The mold is made from fruit or nut wood and the detail is fantastic! You can see some old pastry that is still caught in the mold. The board is well worn and there is evidence of it having lost a piece of wood under the goat. Knightsbridge Cat, front and back - 9 1/8" x 3" x 15/16"
This mold is from Knightsbridge England but it is not known if it originated there. As the photos show there is quite a bit of worm damage but an interesting piece nonetheless. It looks to be made for both Spekulatius and Springerle. Great motifs with the styled cat and the Dragon / Sea Creature. I am not sure of the type of wood but would believe it to be fruit or nut wood. 12 3/4" x 4 3/8" x 1 1/8"
This mold carries the marks IP 111. This mold is from Knightsbridge England but it is not known if it originated there. As the photos show there is quite a bit of worm damage but an interesting piece nonetheless. It looks to be more of a Spekulatius mold than a Springerle mold. Animal mold - 7 1/2" x 5" x 1"
The Bishops - 8 1/8" x 3 5/8" x 1"
Lily of the Valley - 4 1/4" x 3 3/8" x 5/8"
This mold is very deep and very detailed. It gives the impression of a picture in a frame. Above two molds are very special in that they were in the same bakery since at least 1810. They may have been years before that in the family's possession. Both of these molds are quite unique in that there is documentation on their history. The bakery's name, the last owner's name, the location of the bakery and even the first owner of the bakery is known. 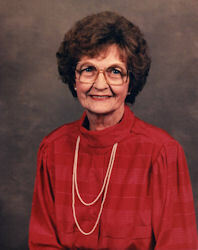 It has always been in the family Lieb. They have well worn edges from years of actual use in a bakery. They were well taken care of. The detail as you can see in the photos is first rate. Buttons, hair, fur, leaves, wings, feathers and flowers all show to have been given great attention to detail. The wood is either fruit or nut. 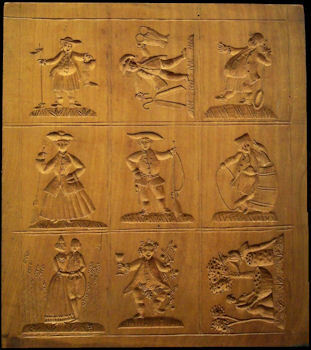 The mold I refer to as "The Bishops" (There are 4 on this mold) has a carving of a dancing jester. He looks to have 2 children in a basket. 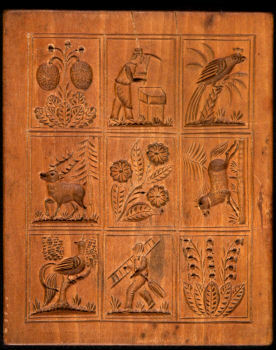 There is also a carving of a donkey that is loaded up with apples? The hairs on the donkey are very fine. The work of a great artist and carver. On the reverse side of this mold there is a single carving of an Angel playing what looks to be a violin. This mold has a few worm holes as are seen in the photos. 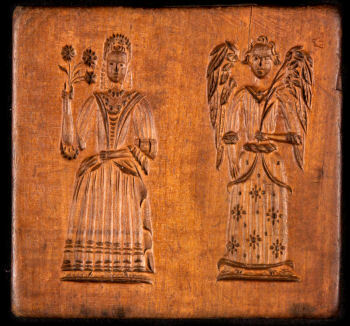 The mold I refer to as the "Animal Mold" also has a carving of an angel looking at and holding an hour glass. A curious motif but an intriguing one. All of the carving on this mold are first rate. As with the other mold, all the hairs, wings, feathers, flowers, fruits, weaves and expressions come to life in all their detail. Lorain, front - 6 7/8" x 5 1/2" x 3/4"
Lorain, back - 6 7/8" x 5 1/2" x 3/4"
This double sided board looks to be from the 19th century. Each animal is covered with fine hair or fur and the birds have very nice feather work. The edges of this board are smooth and slightly worn. No doubt from years of actual use. Professions - 10 5/8" x 9 1/4" x 3/4"
This board has 9 images on it. There looks to be a boot maker, a tailor, a gardener, a barrel maker, a wine maker, orchid workers, a hunter and a lover(?). These images are not deep but they do show good detail. It has a few small worm holes and looks to be from the 19th century. 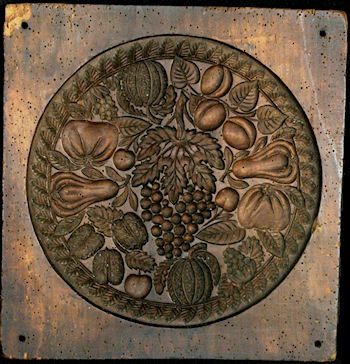 Fruits and Nuts Mold This mold which measures 12 1/2" x 12” x 1 1/2" comes from a Franconian bakery. Franconia (German: Franken) is a historic region of Germany comprising the northern parts of the modern state of Bavaria and the area to its immediate west. When this mold was first presented to me my thoughts were that it was a piece from the Baroque period. It is estimated to be from the mid 1600’s to the early 1700’s. The wood had a great dark patina and it was riddled with worm holes but very few were on the images themselves. 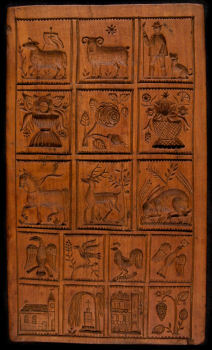 The carvings of the pears, grapes, walnuts, plums, cherries, pomegranate and other fruits were spectacular. A deep mold that I believe was probably for a grand cake topper.